Colostrum or “first milk” is the thick, yellow secretion from the mammary gland. It is produced in the mare’s udder during the last two to four weeks of gestation in response to hormonal changes and contain vital immunoglobulins (antibodies) needed to protect the foal against infectious diseases. The foal must consume adequate quantities these vital antibodies, ideally within 6-8hrs after it is born. Foals that miss out on colostrum are at risk of infection, so ensuring the foal receives adequate colostrum is extremely important. It is a good idea to have some frozen colostrum on-hand before a mare gives birth. In the event that the mare’s own colostrum is poor quality, the mare dies or refuses to let the foal suckle the foal is too weak to nurse, or another unexpected problem crops up, stored colostrum can be a life-saver. Donor colostrum can be collected from mares, excluding those that have foaled for the first time, relatively easily, although some mares will object to being milked. To collect colostrum the mare should be gently restrained by a handler, allowing a second person to focus on the milking. This person should firstly Wash their hands and then clean the mare’s udder with warm water. 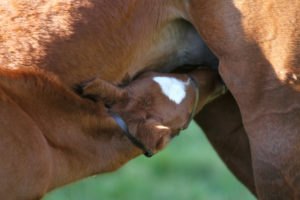 Holding a clean container under the udder the ‘milker’ should grasp the teat between their thumb and forefinger, push up to simulate the foal butting at the teat and then gently squeeze and pull down on the teat. Approximately 250ml of colostrum should be collected and stored for later use. The colostrum should be strained (e.g. through a muslin) and then labelled with the mare’s name, date and specific gravity. The colostrum can then be frozen for up to one year in a household freezer or 2 years in a deep freezer. When needed, the colostrum should be thawed at room temperature or in slightly warm (not hot) water, do not thaw by microwave as this will destroy essential antibodies. If the history of the mare is unknown or they are foaling for the first time they should not be used as a source of donor colostrum due to the risk of neonatal isoerythrolysis (NI).